Those chairs are sick. I'm so impressed that you guys changed the seating all by yourself. Reupholstering scares me! Jeff's Mom is currently recovering her dining room chairs, too! Similar situation, I think she got the fabric for less than $3/yard. Insane. Can't wait to see them in person this weekend when we're in town for Lil' Miss's FIRST BIRTHDAY! How is it even possible that Lil' Miss is turning ONE? I'm super excited for the party and can't wait to get my hands on that lil' bundle of love. As you know, Court asked me to help out by putting together a little "birthday scrap book" where they can record birthday party memories for years to come. I think it's a great idea to have one place where you can keep a few memories of each birthday party. I wish I had something like that from my childhood! 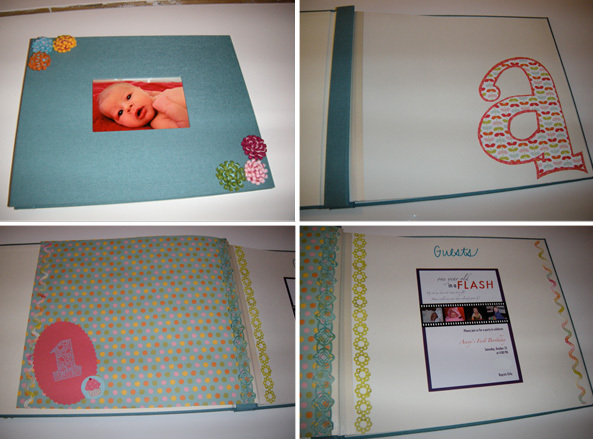 I don't have a lot of experience scrap booking, but you know I'm always up for a crafting challenge. I headed to Paper*Source in Georgetown (Louisville folks: A Paper*Source is opening on Lexington Road Halloween weekend, next to Lotsa Pasta. Check it out, it will change your life!) and collected some fun paper and bits to decorate. Man, I could spend all day in that store. It's exciting and overwhelming at the same time. I finally called it a day and came away with a Large Kolo Newport Photo Album and all the accoutrement's to make it fun. Even though they are 3D and might get smooshed on a bookshelf one day, I couldn't pass up the little stick-on mums for the front. I wasn't sure what to do with the front page, so I added a big two-toned "a" and thought we could always add to it later. Inside, for the two "First Birthday" pages, I kept the left side mostly blank so Dukester can add photos of the party, and then stuck the invitation on the right page with room for guests to write messages and sign their names. I'm pretty pleased with how it came out, I just hope Lil' Miss likes it! PS... A new and better camera is already on my Christmas list, so hopefully one day soon I won't be torturing you with these horrible photos!